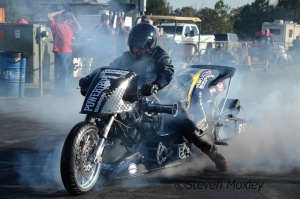 A large group of European riders went across the pond with their bikes to race in the Man Cup World Finals at South Georgia Motorsports Park in Valdosta. The weather was in the high 70’s during the first four days and then dropped 10 degrees on race day with some headwind. During qualifying there were many personal bests and some records set in Top Fuel, Top Fuel Twin, Pro Fuel, and Pro Street. This event will go down in history as one of the best ever. Ian King and Rikard Gustafsson were entered, but it was Larry McBride who stole the show. 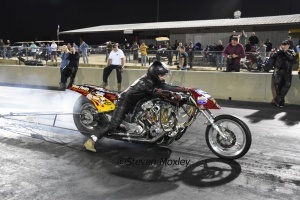 McBride ran a personal best ET of 5.728 on Friday at the expense of a piston. 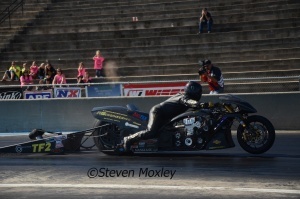 He fitted a new motor overnight and then made history on Saturday with the first 5.6sec TFB pass of 5.677/250.74mph. In the next session, McBride ran the fastest ever speed of 258.27mph. David Vantine was the nearest challenger at 5.843 and he ran a personal best speed of 246.44mph during qualifying sessions. 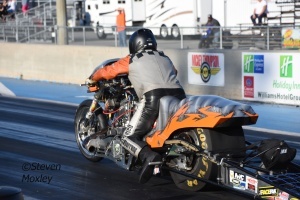 This was Ian King's last race as the owner of the Gulf sponsored bike and King ran 5.918/205.35, his best run of his U.S. season. Rikard Gustafsson recorded his first five second-pass (5.89) during testing on Friday and qualified with a 5.974/240.34mph. Mitch Brown also ran personal best figures of 6.248/224.36mph. King, Wills and Vantine all had traction problems and went out in round one. 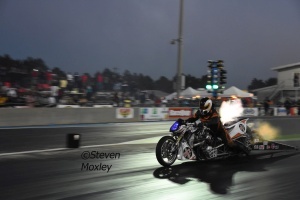 Chris Hand had a small fire while he tried to do a burnout in the semi-finals. That gave Mitch Brown a bye run to his first Man Cup final. 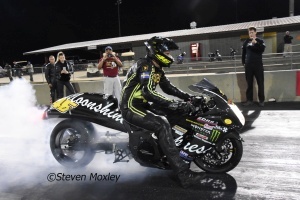 In the other semi-final McBride beat Gustafsson who ran a jaw-dropping p/b of 5.852/247.97 to become Europe’s fastest Top Fuel Bike. 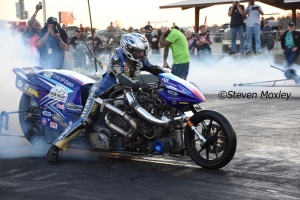 McBride turned the wick up for the final and ran a stunning 5.611 to become the world’s quickest Top Fuel Bike rider and win the event and the Man Cup championship. Brown ran 6.85/191.27 for runner up spot. 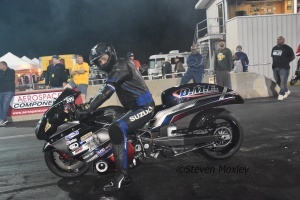 Takeshi Shigematsu ran the quickest time for a V Twin powered bike on US soil of 6.021-194. During that run his handlebars broke and the throttle side came off in his hand. He touched the wall in the shutdown area, lost one of his boots - and safely brought the bike to a stop. He was ok. Tii Tharpe ran a personal best ET of 6.178 for number two spot, just ahead of Pro MC Nordic SuperTwins Champion Tommy Grimes who ran a jaw dropping best ever for the Per Bengtsson Beast team at 6.221/236.13 (top speed of the meet), to become Europe’s fastest SuperTwin bike. NHRA Champion Jay Turner was in fourth spot with a 6.298/227.88. During qualifying, Anders Hornström ran personal bests in every session and qualified with 6.391-223.95 to become Europe’s quickest normally aspirated V Twin. In eleventh spot was Greger Johansson who had clutch issue during qualifying and ran a best of 7.001/177.51. There was a lot of interest in Jaska Salakari after he ran 6.010 in Finland. When he came to the start line for the first time, people were rushing to see and heard this unique machine, with huge header flames in the evening back drop. However Salakari had a cam timing issue and ran a best of 7.035. 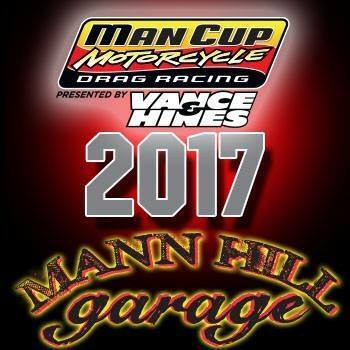 Fourteen-bikes qualified, but Tracy Kile was out of the show with a broken crankshaft after running his best time (6.344) from his new bike. In round one only Salakari from Europe didn’t make it into the next round, when he had traction problems just off the start line against Jay Turner. Johansson ran a personal best of 6.750 against Rickey House. Hornström beat Lyle Newton and Mike Beland broke against Grimes. Shock of the round was Shigematsu losing on a holeshot to Jim Page. In round two, only Grimes of the European bikes went through. Johansson lost to Turner and Tharpe beat Hornström. In the semi-finals Grimes lost to Tharpe (running a personal best 6.164) in a close race. Jay Turner made it an all Turner racing final, after knocking out Page in the other semi-final. Turner turned the wick up and ran his best time of the weekend, 6.198, to defeat Tharpe 6.310. Kirby Apathy had a bad season in 2017 after breaking two crankshafts on motors that he has built. At this event, he had a different motor combination and was hoping for better luck. He ran a personal best of 7.048 to be number one qualifier of a small field. In the semi-finals Apathy ran a jaw-dropping 6.855 to become the first six-second Pro Fuel rider. Apathy won the final defeating Michael Ray 7.144 to 7.908. Frankie Stotz topped the field of 38 qualifiers with a 6.704. Mark Paquette was in the number two spot 6.722. 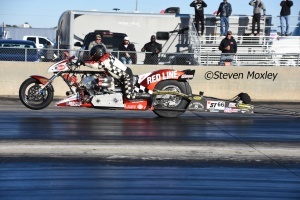 Rodney Williford ran 225.82mph during qualifying. 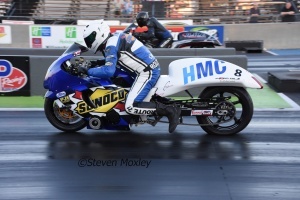 Steve Venables had a DME clutch and different gearing for this event and after a couple of days got into the sixes with 6.981 with a best speed of 209.10mph. 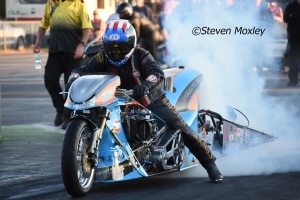 Mogens Lund also qualified with 7.161 using his spare motor. Björn Friström didn’t race in the shootout and was first alternate 7.461. Both Friström and Lund lost in round one of the eliminations. Venables ran his best ET of the weekend, 6.949/208.30, to defeat Ryan Hable. In round two Venables lost to Williford 6.695 to 7.060. 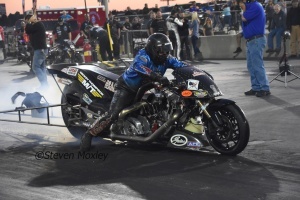 Paquette ran 6.678 to become the quickest-ever Pro Street bike, only for Williford to take it back in the semi-finals 6.676. 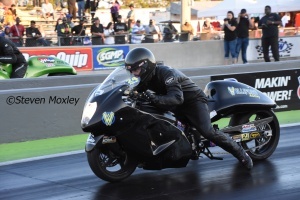 The final featured the two quickest bikes and the race was decided when Paquette pulled a wheelie and Williford took the win light with 7.159. Thirty bikes entered the DME Shootout and Mark Paquette led the field. Round one and Steve Venables faced Mogens Lund. At least one European racer would go through. At about ¾ track Lund’s motor blew (number three conrod broke). Venables lost to Rodney Williford in the next round. Williford went on to win the shootout beating Jeremy Teasley in the final 6.733 to 6.769. Both Mogens Lund and Björn Friström competed in the Pro Open class and Lund tested a new clutch combination and lost in round one. Friström got eliminated in round two.